Welcome to the new Book Nook Reviews written by Librarian Stefanie Claydon. Follow my reading adventures throughout the year by checking out the reviews posted here. I recently took a trip to Scotland and realized in the airport on my way back that I was dangerously close to finishing the book I had packed with me. Naturally this set off a rush to all the airport bookstores I could find to purchase an appropriately packable new book before my flight left. I picked up The Bees by Laline Paull -- but did I really want to read a thriller all about bees? Next I picked up Anansi Boys by Neil Gaiman. Don't get me wrong, I love Neil Gaiman, but I just wasn't sure that was what I really wanted to be reading. I had just finished Take a Thief by Mercedes Lackey and was hoping that the UK bookstores would have more of her fantasy, but alas. I knew I wanted to stick with fantasy so I went up and down the small aisles before I stood before the Terry Pratchett section and lights went off. If you've never read Pratchett, his books are a mixture of humor, satire, and fantasy. 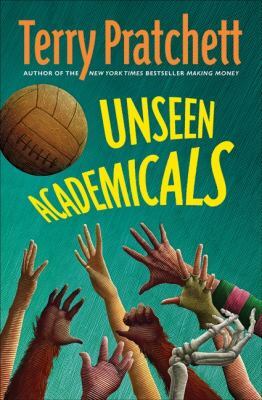 Unseen Academicals particularly pokes fun at modeling, soccer (here called Football), politics, journalists, mob mentality, and academics in a funny tale of the Unseen University beginning its own soccer team in order to keep a financial bequest. Underneath the humor, as with many of Pratchett's stories, is a biting reminder of the human condition. Not everyone is out to be nice and play fair, the daily grind is a struggle against peer pressure and expectations, and it is important to stand up for your friends and loved ones. The fantasy elements are quite heavy in these novels; they take place in a world called Discworld, mostly in the city of Ankh Morpork governed by the Patrician, Lord Vetinari. There are orcs, goblins, wizards, goddesses, vampires, and other fantastic creatures all living together. I really enjoy Discworld and Unseen Academicals is a solid enjoyable book in this series, but not necessarily my first pick to introduce someone to Terry Pratchett. If you're already a fan, go out and pick this up today, especially if you're following the UEFA Euro 2016 matches. But, if you've never read any Pratchett I'd suggest getting Night Watch, Small Gods, or Going Postal to immerse yourself in the absurdity of Discworld.